Congratulations to Swiss Post on receiving the 2018 PostEurop Innovation Award for their Smart Pharma solution in collaboration with modum.io AG. We interviewed Swiss Post Project Manager, Dominik Troendle and Swiss Post Start-Up Partnership Manager, Valerie Riedo for their insights. Q: Can you tell us more about the Smart Pharma project? Its impact both for businesses and citizens? The benefits? 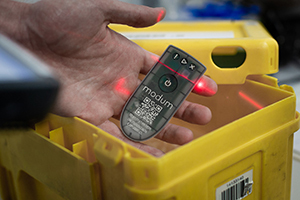 Together with the start-up Modum, Swiss Post has developed a solution to monitor temperatures during the shipment and delivery of pharmaceutical products. Temperature monitoring along the supply chain is vital to ensure that drugs, for example, are safe and effective once they reach the patients. The trusted monitoring and easy control and handling of the digital data collected can bring a positive impact to both the businesses involved in the distribution process and the end consumers. The Smart Pharma project enables the data provided by temperature sensors to be automatically read out by Swiss Post as a third-party logistics provider, at point of delivery and reliably secured on the blockchain. This way, the pharma producer, for example, can pre-program alarm criteria, monitor shipment status, and see the data collected during transit immediately upon readout. By using the blockchain we can increase overall trust in this sensitive data and support regulatory compliance under the pharmaceutical industry's stringent requirements. Q: Can you tell us about Modum? What inspired the start-up? Modum is an exciting young company that has been developing monitoring solutions for quality-sensitive supply chains since 2016. Their blockchain-based solution MODsense is very easy-to-use. It can ensure quality and support regulatory compliance for high volumes of shipments in last-stage logistics. Recorded environmental data — specifically temperatures in the case of Smart Pharma — are secured on a blockchain to increase the confidence between producers, logistics partners, and consumers so that all parties can be certain that quality has been ensured. Q: Can you tell us about your collaboration with Modum? Modum applied for the Swiss start-up programme Kickstart Accelerator in 2016. They were one of 30 selected start-ups out of 800 applicants. It was during this programme that members of the Swiss Post Open Innovation team met the Modum team and our cooperation began. The start-up participated in joint co-creation workshops and started to work on a first proof-of-concept for their digital supply chain monitoring solution. The start-up also benefited from regular sprint meetings and from coaching support from Swiss Post. This collaboration led to development of the awarded Smart Pharma solution. Q: What are the key learnings for other postal operators who are looking to partner with start-ups? First, our approach as a postal operator is to collaborate closely with different start-ups identified through national and international scouting. Our experience shows that such an approach can help start-ups to focus on customer needs and strengthen the market fit of their solution. Secondly, it seems essential to rapidly develop and test applications as we did with Modum for temperature monitoring for pharmaceutical products. Each year, such collaborations between Swiss Post and start-ups has led to various projects: many pave the way to important developments of products and services in the postal markets. Q: What are your future plans for smart supply chain monitoring? The technological solution used for the smart temperature monitoring and the insights gained can be used to address different traceability and monitoring challenges in the distribution process. With the boom in e-commerce, it becomes increasingly important for the end consumers to be sure about the origin, authenticity and quality of the products they get delivered by the postal operator. Swiss Post is keen to develop further digital supply chain monitoring. There is also a huge potential to automate and simplify the seamless collaboration throughout the delivery process.